I do not update this page anymore. Please visit rajibrana.org for updated informaiton. Dr. Rajib Rana is a research scientist in the Centre for Health Sciences Research at USQ, and an honorary fellow at the School of ITEE, UQ. Prior to joining USQ in 2015, Rajib was a Post-doctoral research fellow at the Autonomous Systems Laboratory, CSIRO (2012-2014). Before that Rajib worked as a researcher in the SAIVT laboratory at QUT and in the Ubiquitous Computing Group at UQ. Rajib is an experimental computer scientist working in the area of ubiquitous computing. He is passionate about data-driven health care for maintaining wellness. His research interests span developing reliable data extraction algorithms from low-power mobile devices, and harness this burgeoning data stream to model behavioral, physiological, physical and emotional states of human being. Rajib has an h-index 13. The h-index is a method for ranking researchers based on impact -- see Google scholar profile for his papers and citations. His projects have also been featured by prestigious science review portals including MIT Technology review, Wired (UK), ABC Science, ACM Communications and many more. 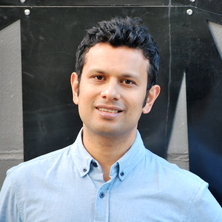 Rajib received his Ph.D. in Computer Science and Engineering (2011) from the University of New South Wales, Sydney, Australia with the Prestigious International Post-gradate Research Award, which usually has less than 1% success rate. Upon completion, Rajib received the Post-doctoral writing fellowship from UNSW, which had approximately 5% success rate. In his Ph.D., Rajib developed Sparse Approximation Methods (based on Compressive Sensing and Sparse Coding) with his advisor Chun Tung Chou to address three fundamental challenges of Wireless Sensor Networks. Prior to Ph.D., he spent one and half year as an analyst programmer in the Telecommunication Industry. Rajib received his Bachelor degree from the school of Computer Science and Engineering, Khulna University, Bangladesh. He received the prestigious Prime Minister's and the Presidents' Gold Medal for his extraordinary academic achievements in his Bachelor studies. IoT, Deep learning, Privacy-aware Mobile Compuitng, Context-Discovery, Robust Mobile Computing, Human behavior modeling, Sparse approximation - Compressive Sensing - Sparse Coding. My goal is to deliver cost-effective and ubiquitous solutions for various health problems. In particular, I aim to reduce the burden of chronic diseases (Chronic Mental illness, Cancer, Type II diabetes) from Australian Economy by facilitating prevention through the use of technology.